Freshly cut bermuda or fescue comes on pallets of 500 sq. ft. or less. If over 500sq. ft. delivery is free. 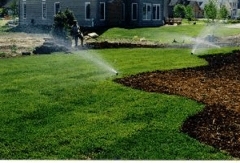 Sod is the best way to go when it comes to starting or repairing a yard. Hybrid Bermuda and Triathalawn Tall Fescue are the most common types being used today. Copyright © 2014 Buck's Landscape Material and Pond Shop. All rights reserved.